Donald Trump's State Visit is back on after the US President said he will be coming to London. 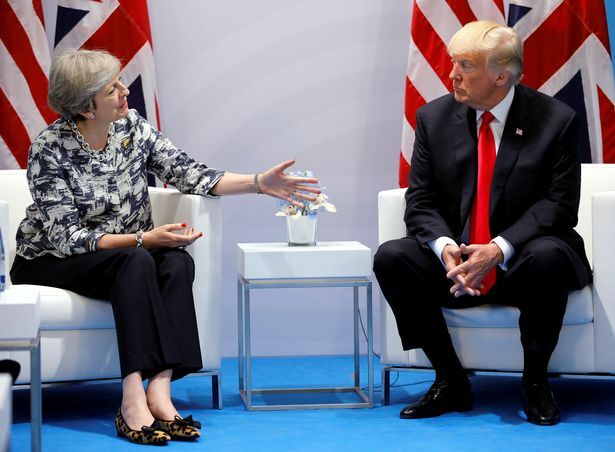 Mr Trump hailed the "very special relationship" he had forged with Theresa May as the pair met for talks on the margins of the G20 in Hamburg. And he said he expects a trade deal with the UK to be completed "very, very quickly ". The pact on new trading arrangements with Britain would be "very powerful" and be great for both countries, he added. Britain cannot seal a separate trade deal with the United States until it has left the European Union, which is due to be in 2019 after two years of Brexit negotiations. He added: "Prime Minister May and I have developed a very special relationship and I think trade will be a very big factor between our two countries." Mr Trump said he "will be going to London", but asked when, he replied: "We'll work that out." Mrs May was quick to extend the offer of a State Visit after Mr Trump's election in November as she bids to build alliances for life after Brexit. But the President’s planned visit triggered a huge wave of anger, with 1.85 million people signing an e-petition opposing the trip and MPs debating the visit in Parliament. A counter-petition calling for it to go ahead received 311,000 signatures. And it looked to have dropped down the agenda when it was not mentioned in the Queen's Speech, and it was reported the President was wary of visiting because of the likelihood of protests. The Queen outlined plans to welcome the King and Queen of Spain next month as she opened Parliament in June.